As shown by the red dots that represent where the ETF was trading 5 days ago, markets have come in quite a bit. 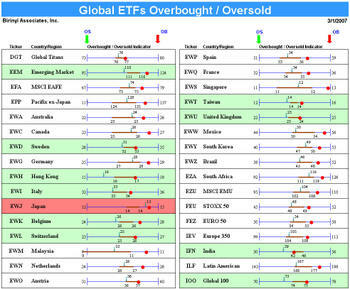 Most of the global ETFs that were overbought are now at the bottom or below their trading ranges. Tread carefully until we see some stabilization. The best opportunities come when the ETF or stock is at the bottom of its range but to the right (higher) of the red dot (where it was 5 days ago).